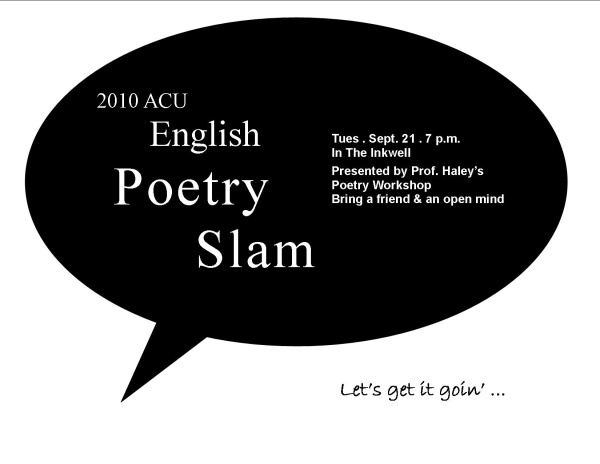 Every fall the English 323 Poetry Workshop spends several weeks studying the art of spoken word poetry. The culmination of their efforts is a poetry slam. The 16 poets will gather and each offer 2.5 minute performances of their poems. Three audience members will be chosen at random to serve as judges and deliver scores from 1-10 points. The poet with the highest score wins. The audience shouts its approval, hisses what it doesn’t like, and generally behaves like people having an extremely good time. How can you not? You’re going to hear passionate words and language. It may be about the political scene, our culture, race, gender, or whatever the poet thinks is worth bringing to your attention. But rest assured. This is not doilies and flowers polite-type poetry. The goal is simple. To rock the joint. So if you don’t have a class or a Summit commitment next Tuesday, cram into The Inkwell with us and give spoken word a try – a.h.